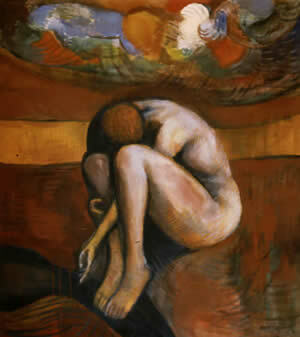 "Narcissus" 1991, acrylic on canvas, 50" x 44" approx. This painting is now temporarily back in the possession of the artist & is for sale. Please email if interested. Here is a larger version. This is a more recent photo. The original drawing can be seen in the drawings gallery. These are color paintings, mostly. The artist prefers to work in oil on canvas for the richness, depth & texture, but acrylic is quicker-drying and has several other advantages.